DecoArt Patio Paint- Neon Green, Orange, Yellow, Pink and Yellow. 1.Consider what design you would like to have on your cork coaster and begin cutting strips of Dovecraft Washi Tape. 2.Mask off the areas you would like to be untouched by the DecoArt Patio paint by using strips of Dovecraft Washi Tape. 3.Choose which colours you would like to paint on to your coaster from the DecoArt Patio Paint range. We have chosen this specific collection of paints as they’re water resistant, perfect for this project! 4.For our coasters, we have used the Neon Paint range to achieve a bright and colourful effect. Begin to paint your chosen areas, and make sure to choose different colours for each section to get an interesting pattern. 5.Ensure to do three coats of each colour so that the area is completely covered and that the colour is vibrant on your coaster. 6.Carefully peel back the washi tape to reveal your design! Now you’re ready to host any party coming your way! This colourful project will be perfect for brightening up your home and it’s a brilliant technique to use to spruce up an unloved item. 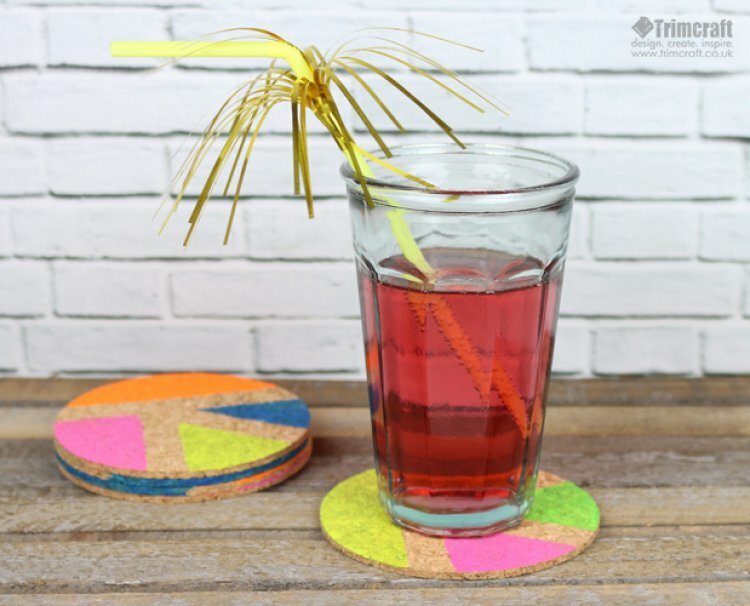 We love this quirky design, how will you upcycle your coasters? We’d love to see your DIY projects so don’t forget to upload them to the project gallery and to #Trimcraft when uploading to social media!